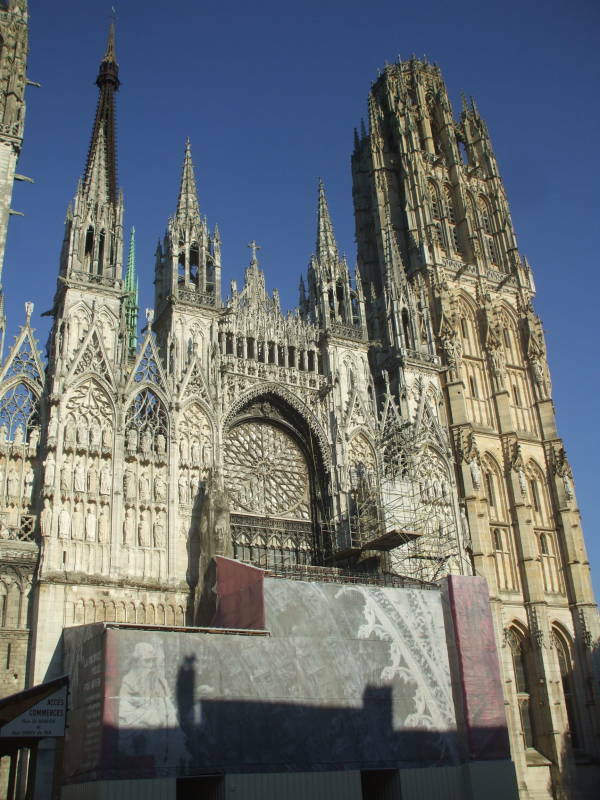 Rouen is the capital of the region of Normandy. It has been a prominent city since medieval times. It is on the Seine river well below Paris, not far from the river's mouth, and ocean-going ships can travel as far up the Seine as Rouen. 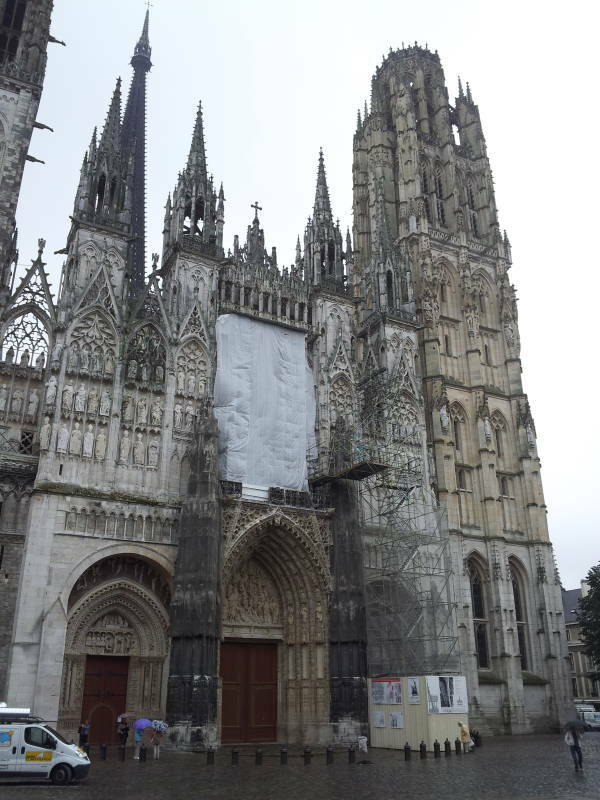 Rouen was established by the Gaulish Veliocasses tribe who controlled the region before the Romans arrived and made it one of their prominent cities in Gaul. 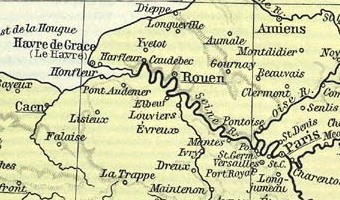 Rouen became the seat of a bishopric in the 400s, and then was one of the capitals of Neustria, the western part of the Merovingian kingdom of the Franks. Neustria was created in 511 when the kingdom of Clovis I was divided among his four sons. The Norsemen began raiding the nearby coast in the 800s. In 841 they sailed up the lower Seine river and captured Rouen. They later ventured as far upstream as Paris. 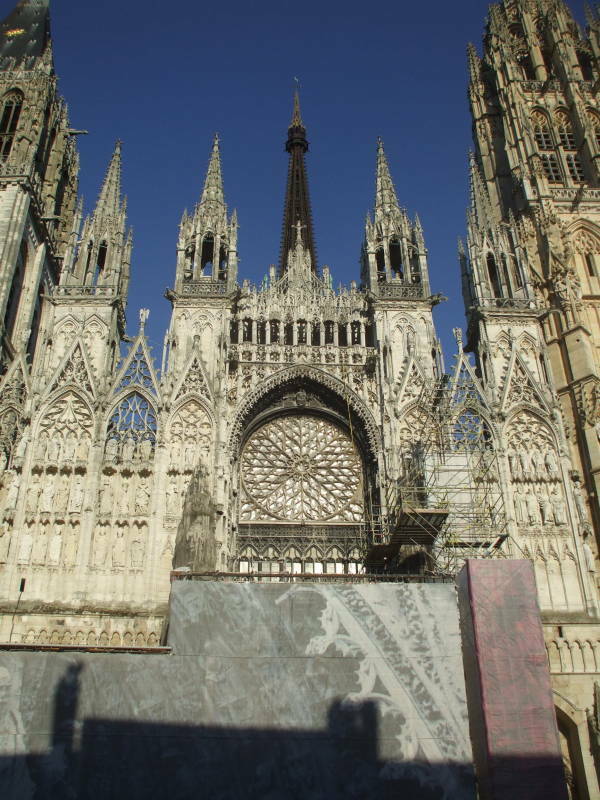 Rouen was their continental capital, and the land controlled by the Norsemen or Normans became known as Normandy. The French king made a deal with their leader Hrólfr in 918, giving him greater autonomy in Normandy in return for leaving Paris alone and protecting it from Viking raids by other Norse groups. Hrólfr became known as Rollo. The Battle of Agincourt on Saint Crispin's Day, 25 October 1415, was a major victory for the English in the Hundred Years' War (which lasted a little longer than that, from 1337 through 1453). King Henry V of England continued taking land in northern France, and captured Rouen in January 1419. 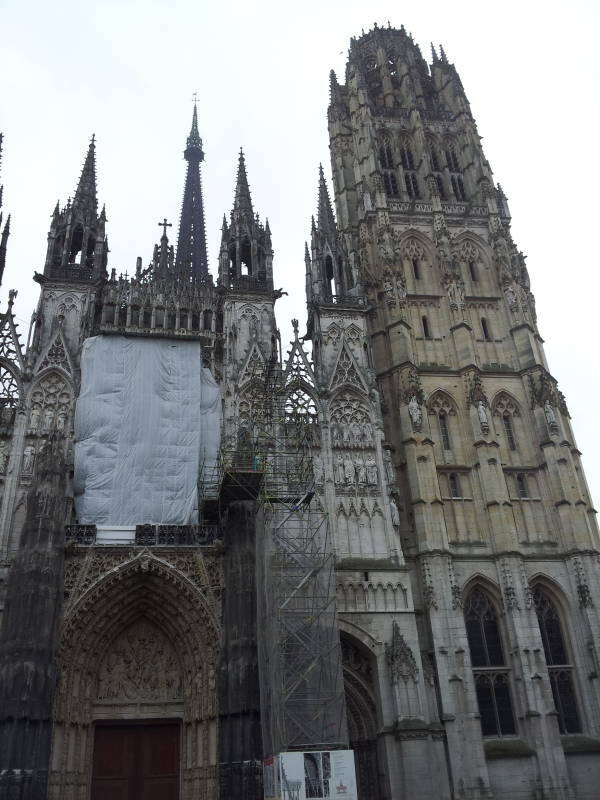 Rouen then became the base of English power in occupied France. Jeanne d'Arc (or Joan of Arc) was brought here and put on trial around Christmas of 1430. 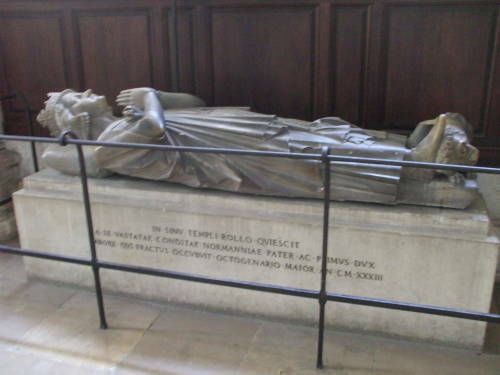 After the long church trial, she was burned at the stake in the market square on 30 May 1431. King Charles VII of France recaptured Rouen in 1449, ending 30 years of English occupation. 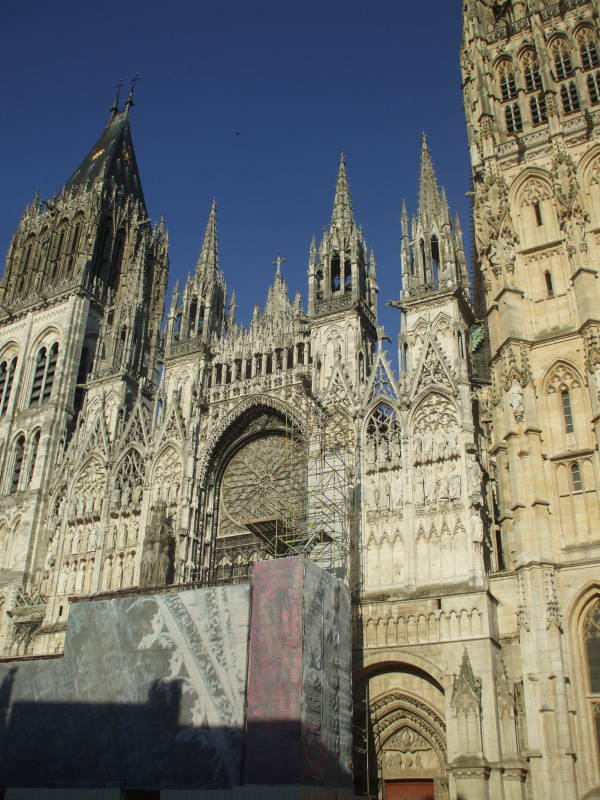 By now Rouen was the fourth largest city in France, after Paris, Marseille, and Lyon. Its ship-building industry kept busy. Fishermen from here went as far as the Baltic Sea, and in the 1500s the port of Rouen was busy trading with Brazil to import dyes. 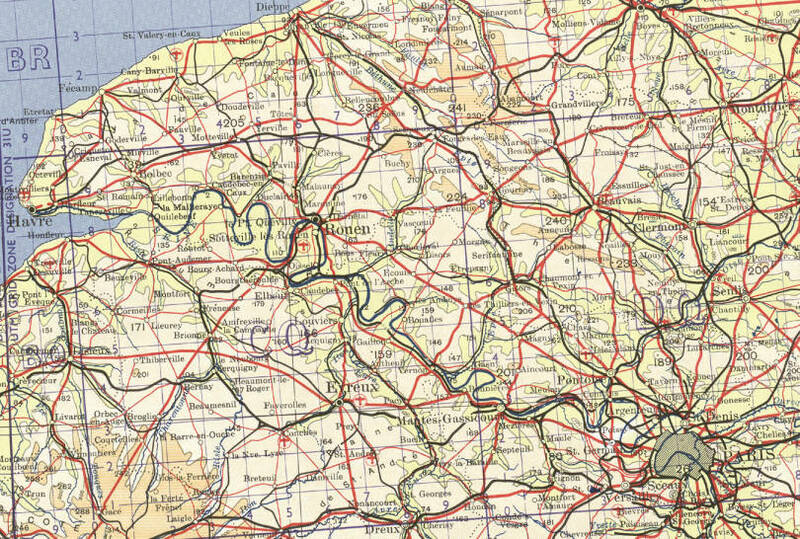 These pages have shown several locations along the Seine between Paris and Rouen — Rolleboise, Mousseseaux-sur-Seine, Lavacourt, Vétheuil, Haute-Isle, La Roche-Guyon, and Château Gaillard. Now let's see Rouen. 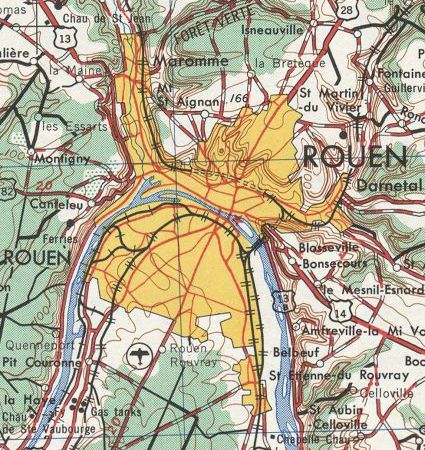 Rouen now has a population of more than 110,000 people. The old city center is on the north side of the Seine. The south half, within a tight loop of the river, is more industrial. 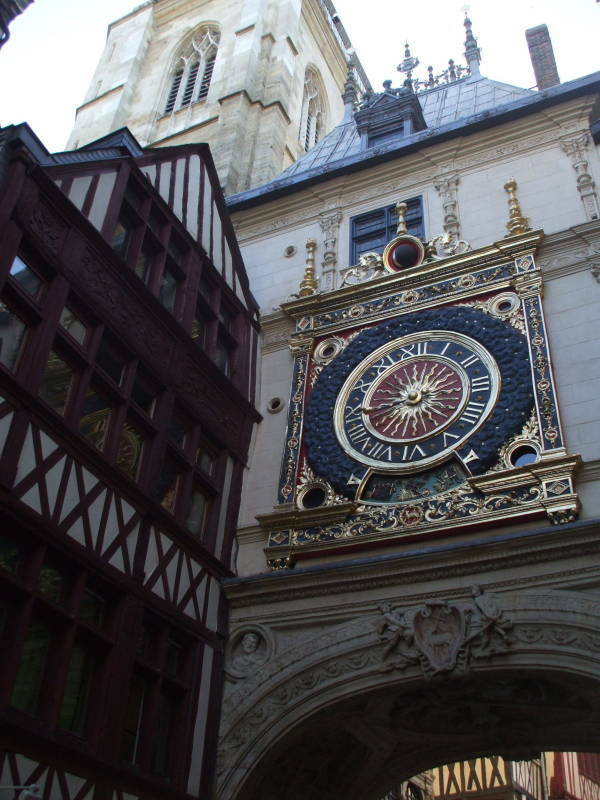 The Gros Horloge or the Great Clock was built in 1389. It indicates the time, phase of the moon, and day of the week. 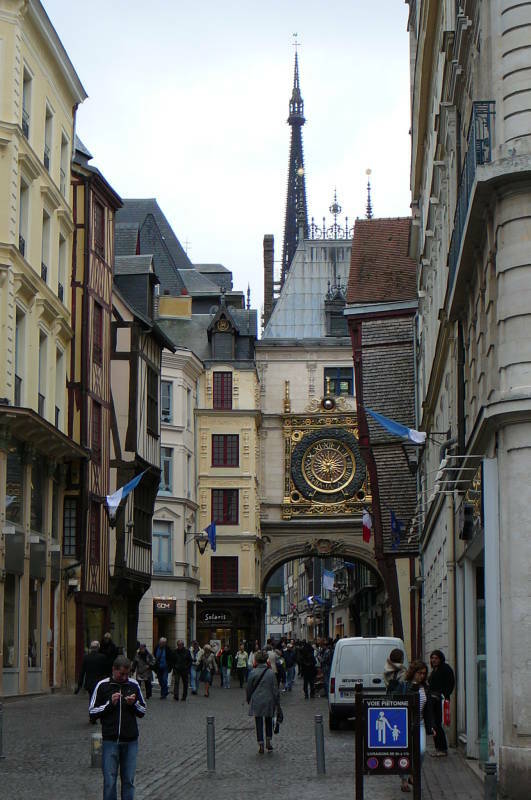 We will pass under the clock and continue down Rue du Gros Horloge to Cathédrale Notre-Dame de l'Assomption. 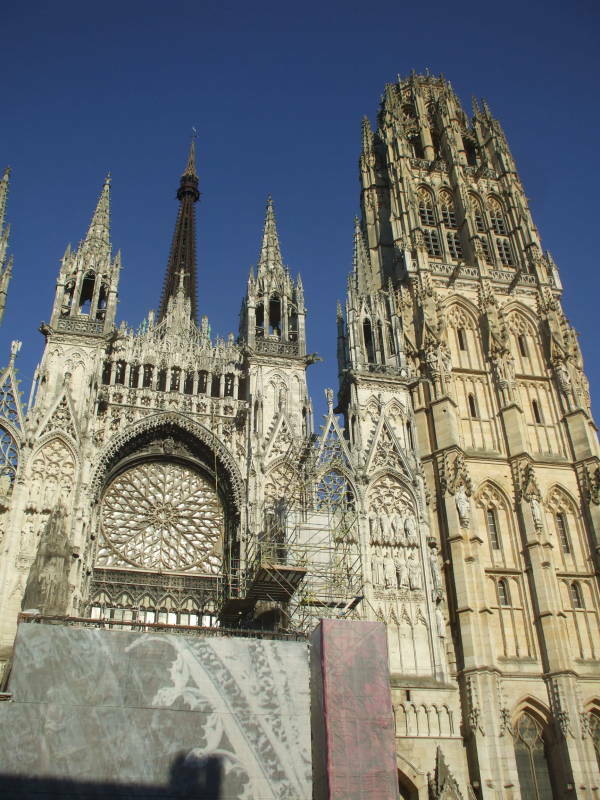 Claude Monet created over thirty paintings in the Rouen Cathedral series, capturing the appearance of the façade in varying light at different times of the day and year. This wasn't his first series of paintings of a single subject, but it was his largest, and most of his works before this series had been landscapes. He painted them in 1892 and 1893, working out of temporary studios he set up in rented rooms across the street from the cathedral. He then reworked them in his studio at his home in 1894. 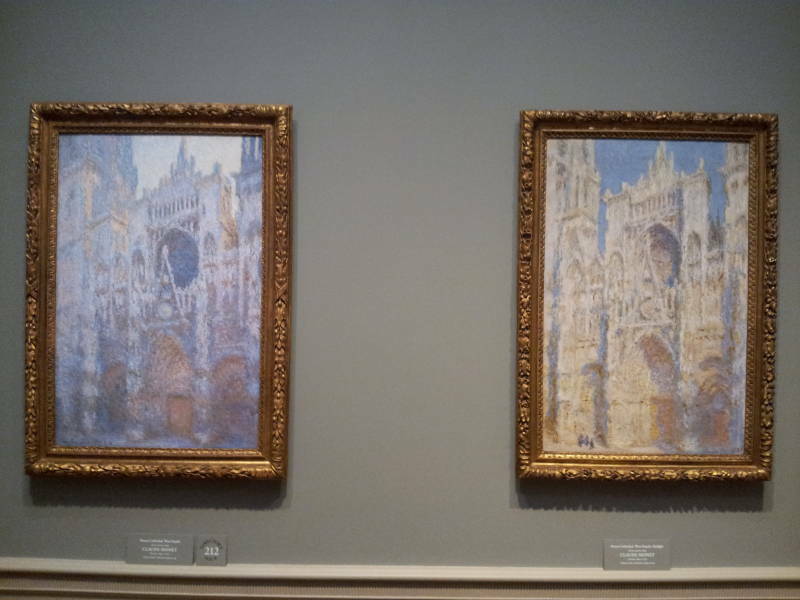 Two of Claude Monet's Rouen Cathedral series at the National Gallery of Art in Washington D.C. He selected what he thought were the twenty best and displayed them at his Paris dealer's gallery. Cézanne and Pisarro visited the dealer and praised the series, and there were some calls for the French state to buy the whole series and exhibit the paintings together. That didn't happen, eight of the paintings sold during the exhibition and the rest were purchased and split up later. 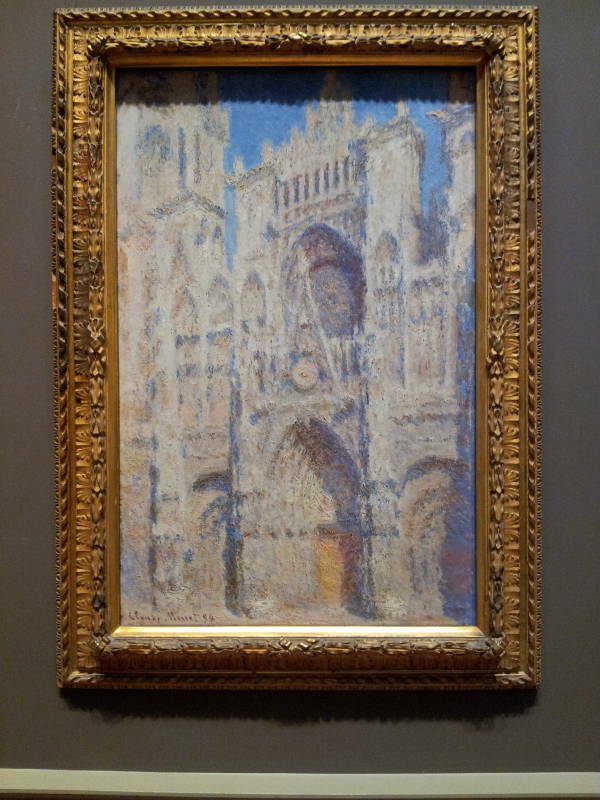 Claude Monet's Rouen Cathedral: The Portal (Sunlight), 1894, at the Metropolitan Museum of Art in New York. Several ended up at Musée d'Orsay in Paris. Others are at the National Gallery of Art in Washington, the Metropolitan Museum of Art in New York, the Musée Marmottan Monet in Paris, the Pushkin Museum of Fine Arts in Moscow, the National Museum of Serbia, J. Paul Getty Museum in Los Angeles, Folkwang Museum in Essen, Germany, Pola Museum of Art in Hakone, Japan, Clark Art Institute in Williamstown, USA, National Museum in Cardiff, UK, Beyeler Museum in Riehen, Switzerland, and the Musée des Beaux-Arts de Rouen. There has been a church on this location since the late 300s. 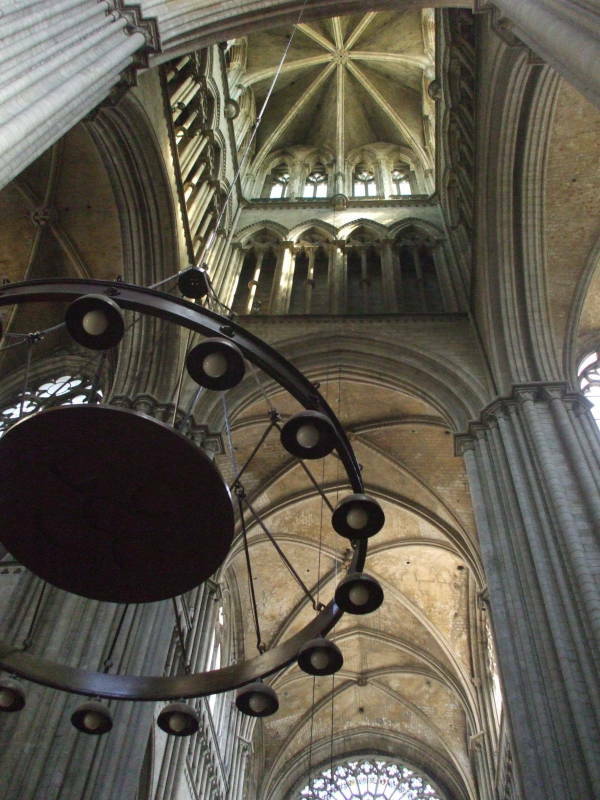 A cathedral was then established early enough that Saint Ouen had reason to enlarge it in 650. 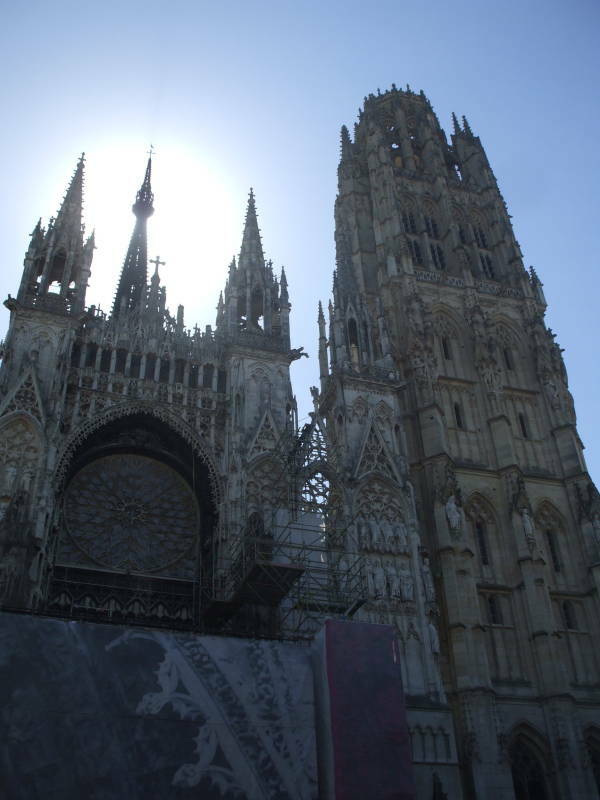 Rouen has always been prominent, Charlesmagne visited the city and its cathedral in 769. The nomenclature is that a church is a religious facility for the local or neighborhood people, while a cathedral is the seat of a bishop. Literally the "seat", it's from the Greek καθέδρα. Some languages derive their term for cathedral from the Latin domus ecclesiae or domus episcopalis, like the German Dom, Dutch Domkerk, and Italian Duomo. Russian, Ukrainian, Belorussian, and Serbian use собор (sobor). A basilica, from the Greek βασιλικὴ στοά, was originally a church built along the standard rectangular plan of a Royal Stoa or tribunal chamber of a king. Now it has a specific meaning within Roman Catholicism for a large church that has been granted special ceremonial rights by the Pope. For example Basilique du Sacré-Cœur or the Basilica of the Sacred Heart in Paris. A Norse raid in the 800s destroyed most of the old city, including the cathedral. Once Rollo took control the Norse were beginning to convert to Christianity. The cathedral had been rebuilt. Rollo was baptized here in 915 and buried in 931. His grandson Richard I enlarged it in 950. A new cathedral began construction here in the 1100s. 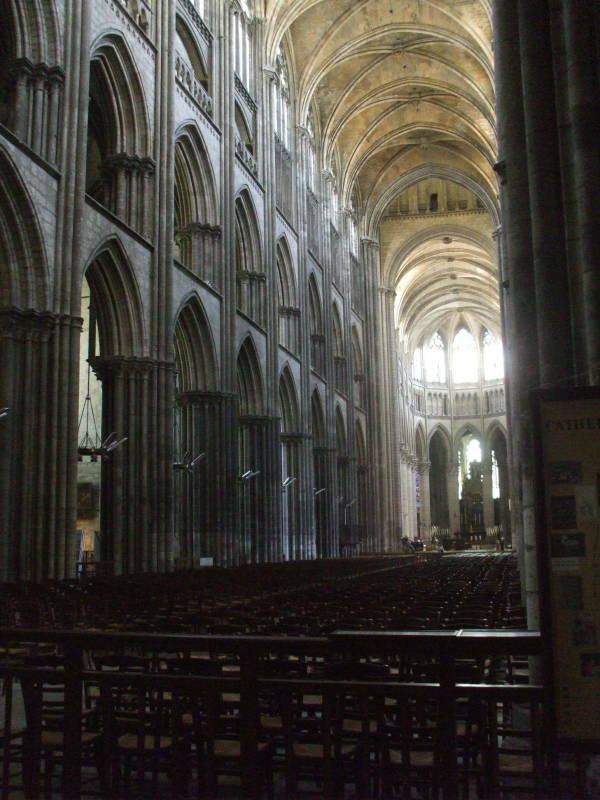 In 1200 the building was mostly destroyed by a fire that left just part of the nave, one tower, and the side porches of the façade. Much of what we see today was built through the 13th century and into the early 14th century in the Early Gothic and High Gothic styles. Some of the windows have glass from the 13th century with "the blue from Chartres", a special cobalt blue. Pieces continued to be added in Late Gothic (or Flamboyant) style in the 15th and 16th centuries. People were not allowed to eat butter during Lent unless they paid for a special indulgence. The sale of those indulgences financed the construction of a tower known as the Butter Tower. The cathedral was heavily damaged during the Wars of Religion when Calvinist forces damaged much of the stained-glass windows, statues, tombs, and furniture. Then, during the French Revolution and its war on religion, the national government took control of the furniture, sold some statues and furniture to raise money, and melted down the chapel fences to make guns. Then it suffered heavy damage again during World War II. 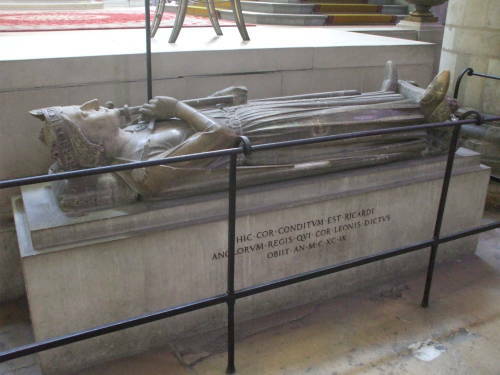 The tomb of Richard Lionheart contains just his heart. Some of his lower digestive tract is buried within the church of the Château de Châlus-Chabrol in Limousin, in the southwest toward Aquitaine. He was struck by a crossbow bolt while fighting in 1199 to seize that castle. The wound became septic, he died, and they removed and buried his bowels in the local church. The rest of him is buried at Fontevraud Abbey near Saumur. Richard's ancestor Rollo is buried (intact) in the cathedral. He was originally known as Hrólfr in Norse, he was later known as Rollo (a Latin translation of Hrólfr) and baptised as Robert. The locals called him Rou or Rouf. Rollo was a Norseman who became the first ruler of what we now call Normandy. Rollo was born on the west coast of Norway in 846. He led raiding expeditions to Orkney, Scotland, England, Ireland, and Flanders. Viking actually means raiding, it is an activity and not a people. He then led raiding expeditions to the Frankish coast, and established a permanent base on Frankish territory on the lower Seine river. He seized Rouen in 876 and led a Norse fleet on up the Seine to besiege Paris, according to one historian. Charles the Simple, the unfortunately named king of West Francia, made a deal with Rollo in 918. The Frankish king would formally cede land along the Seine between Rouen and the river's mouth to Rollo, in exchange for Rollo to stop his raiding and defend against incursions by other Norse warrior groups. Rollo was recorded as the leader of these Viking settlers in 918, and he ruled as Count of Rouen and Duke of Normandy at least until 927. His descendants carried out the Norman conquest of England in 1066, the conquest of southern Italy and Sicily over the following two centuries, and came to rule Norman England, the Kingdom of Sicily, and the Pricipality of Antioch from the 10th to 12th century. 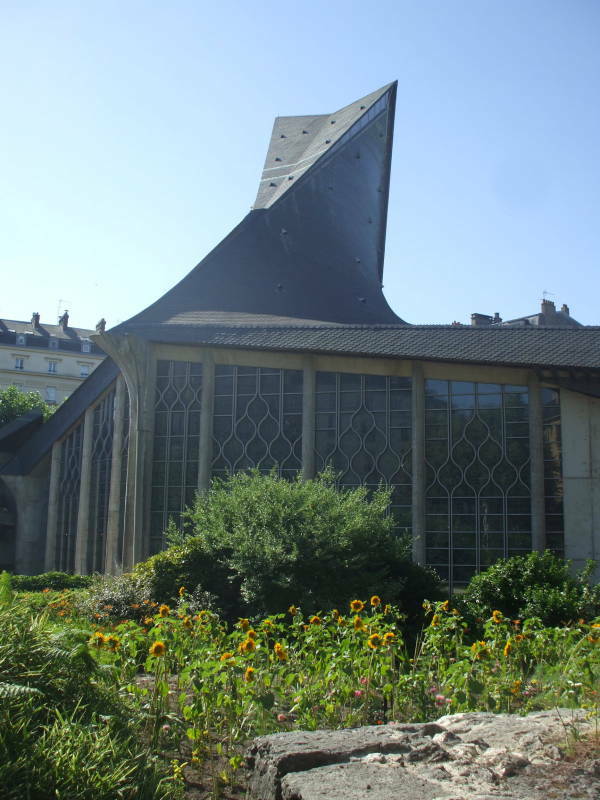 The Église Sainte-Jeanne-d'Arc or the Church of Saint Joan of Arc was completed in 1979. It sits at the center of Place du Vieux-Marché, the old market square, where Joan of Arc was burned at the stake for heresy in 1431. The stained glass windows came from the 16th century Church of Saint Vincent, which had been stood just a few meters away before being almost completely destroyed during World War II. 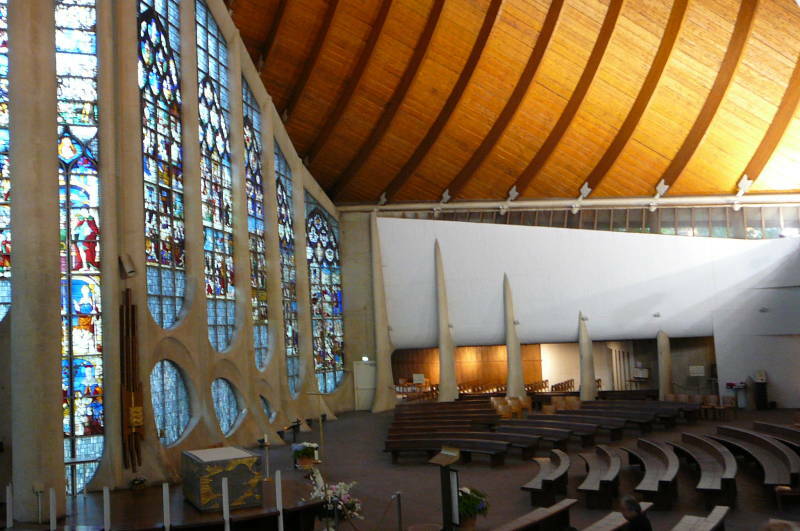 The windows had been removed early in the war, and were used when the new church was designed in the 1970s. The exterior and interior are intended to resemble an overturned Norse longship, and also to represent the flames in which she was killed. 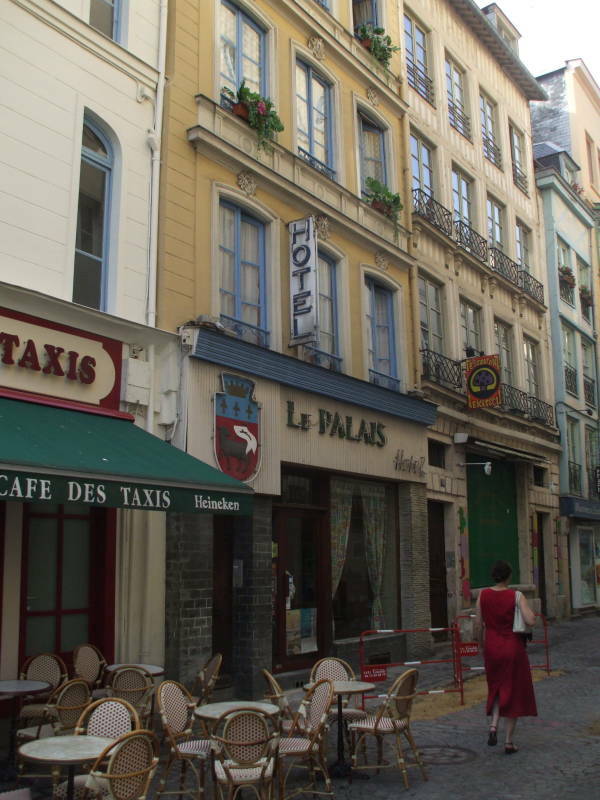 The Hotel Le Palais is a nice place to stay in the old city center. 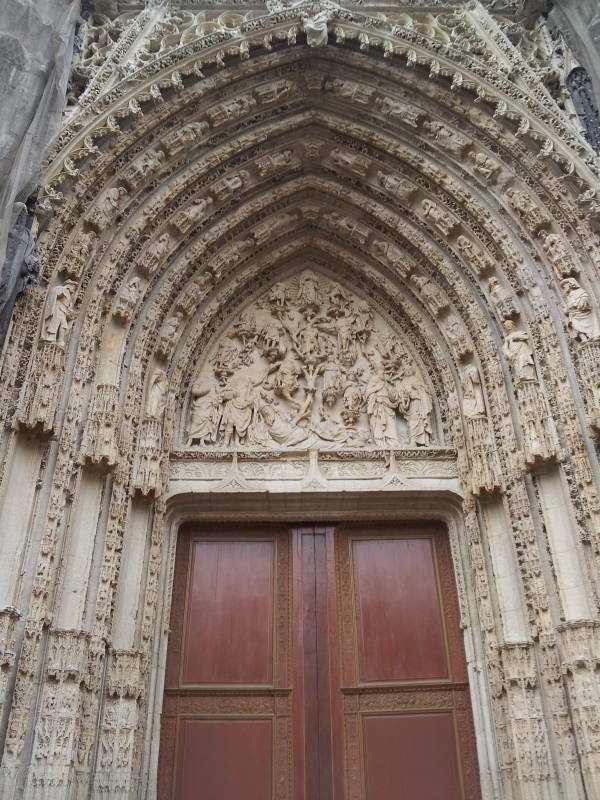 It is mid-way between Église Sainte-Jeanne-d'Arc and the cathedral. The Rue du Gros Horloge is just down at the next corner.